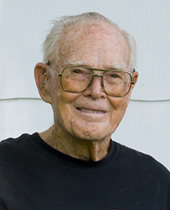 On August 3, 2006, at the age of 96, Trent Lane established a new world record for the hammer throw at the USA Track & Field national tournament. This record throw of 20.15 meters came just a year after he set world records at the 2005 World Masters Games for the discus and javelin. Trent Lane apparently missed the memo about slowing down after 65. While it’s increasingly common for people to pursue new goals and seek new adventures upon their retirement, it’s another matter to set your sights on a track & field world record. Most would agree that’s certainly raising the bar to whole new level. Through most of his life, Trent was one of the last people you’d expect to be recognized by Geezerjock magazine (yes, it really does exist) as their “2005 Geezerjock of the Year.” A self-described math and science nerd, Trent earned a bachelor’s degree in chemistry and a masters in physics before completing his coursework for a doctoral degree in physical chemistry from LSU. He then pursued a long and respected career in petroleum research. Not exactly the path you’d expect from a typical “jock.” But thankfully, typical is not a word you’d use to describe Trent Lane. Mr. Trent Lane – man on the go – a Peoples Health Champion.